I love cooking for friends, so despite the workload I’ve been facing recently, I took a little time off and started cooking a meal consisting of a starter dish and bread, I’d never made before and just started creating in my mind as I went along with it. As the weather was warm and reminded me of summers in Greece, I decided to go for okra. I was a bit unsure of the success okra would have at my small dinner party, in Greece you’d hardly serve this dish for dinner nor find it in restaurants, but only during lunch time and especially at places serving more home-cooked food than fine dining. But the nutritients in this dish and the medicinal properties okra has really makes this simple dish deserve a wider acceptance than it gets. It’s made usually in a stew with herbs and tomato sauce, with meat or chicken or vegetarian. I remember last time I cooked bamies, the Greek word for okra. It was at my Greek Cookery Class a year ago, when I for the first time had one vegan person attending the class. And as I try to cater for all, I was put on the spot! What to cook for a class this time? No milk, no goat’s milk, no cheese etc. 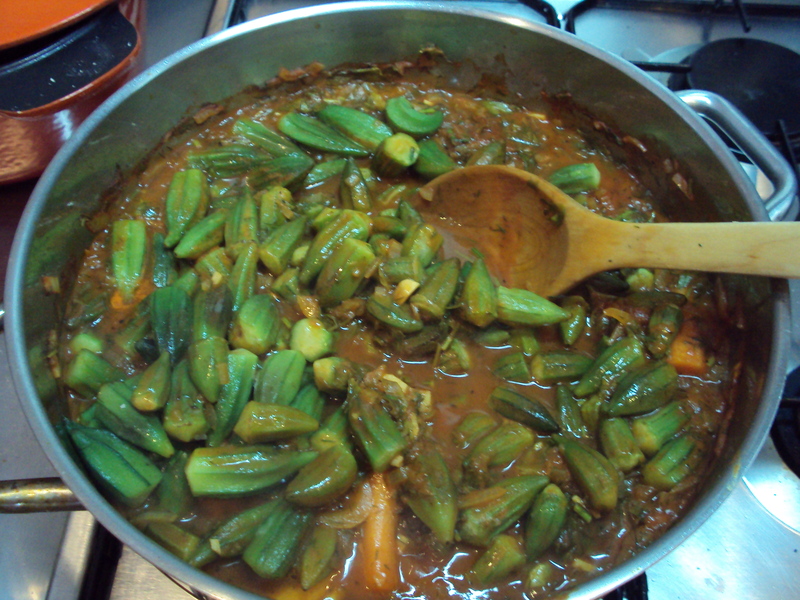 And then I remembered, one of the vegetables so few people know how to cook, so I introduced okra to the class. We made two versions of the dish, one with chicken and one without. I was surprised to see what success this dish was, who would’ve imagined? So yesterday, I had that in mind, hoping my guests would like the stew with okra. But just in case, I made a hearty and rich starter with aubergines, pasta and garides saganaki baked in the oven! 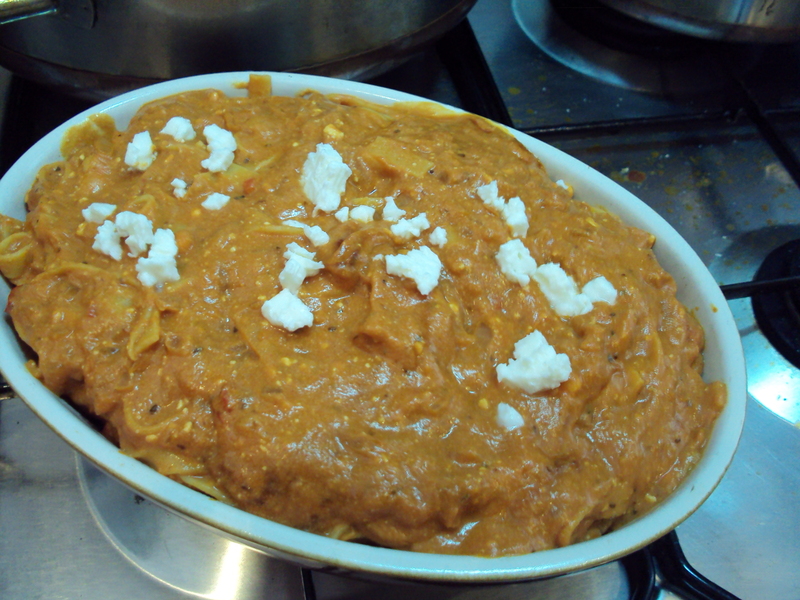 The bottom of the dish has some pre-baked aubergine slices, then pasta, prawns and topped with the sauce of the garides (=prawn) saganaki to keep both pasta and prawns moist after baking it in the oven. On top of that, I made some dough for bread, but lacking time to bake it in the oven, I thought it’d be quicker to fry the bread in the pan first and finish off baking it for a few minutes in the oven. 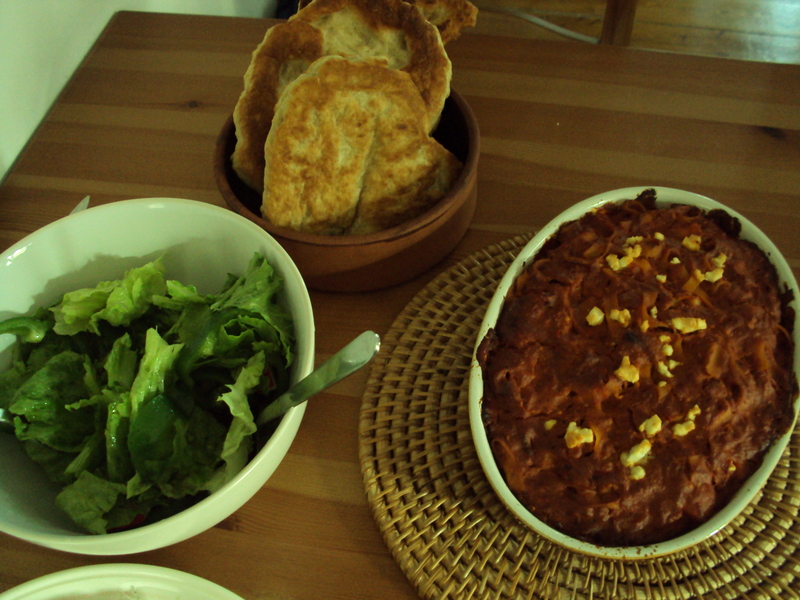 Three fairly simple dishes, which took some time to cook. The trick with most Greek cooking is that it is not so difficult to make, you just need the patience for it! 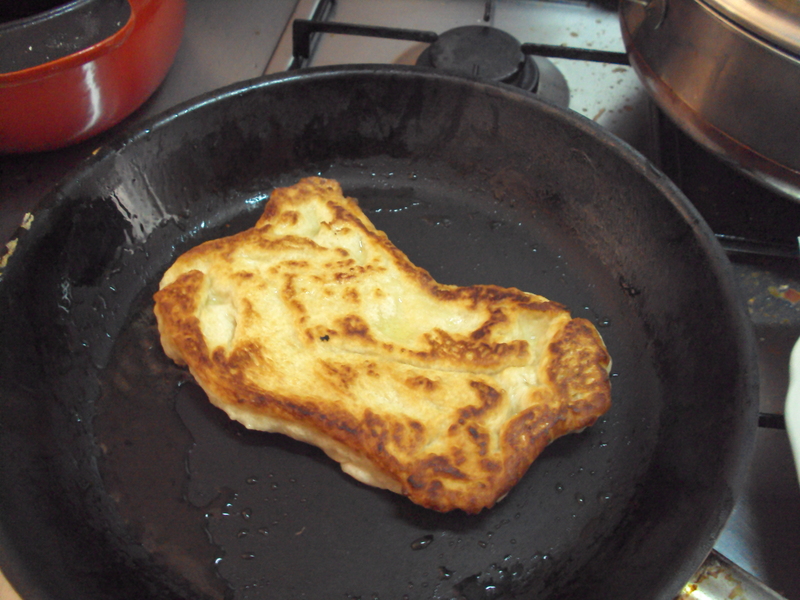 This entry was posted on May 21, 2010 at 4:51 pm and is filed under Greece, Greek Cookery Class, Greek food, Greek Supper Club, Making bread, Supper Club, Supper Club London, Supperclub, Uncategorized. You can follow any responses to this entry through the RSS 2.0 feed. You can leave a response, or trackback from your own site. I am delighted to have given you a spark to make the pasta bake. Glad you enjoyed it and perhaps a cooking class will try and re-create the dish soon? Maybe it will turn up in a class, but I prefer the more traditional dishes and not so much fusion which this pasta bake is. Never say never though! I’ve made mydia saganaki in the class a few times, and it’s a surprise for most people coming in to cook this as they never anticipate such flavours or combinations with feta and seafood. And yeah, always a pleasure reading your blog!